Community activists in the South Bronx have been fighting a long time to remove the Sheridan Expressway, a short freeway that cuts off their neighborhoods from the Bronx River. After the state Department of Transportation rejected the teardown in 2010 and city agencies ruled it out again last year, advocates trimmed their sails and worked for the best option short of complete removal. And last night, the effort to reimagine the Sheridan took a major step forward: The city’s study team officially recommended transforming the Sheridan Expressway to a surface road, opening up land for park access and new development. The city’s multi-agency team, funded by a $1.5 million federal TIGER grant, included staff from the Department of City Planning, NYC DOT, and the Department of Housing, Preservation and Development, along with the Economic Development Corporation. Now that the two-year study process is complete, the focus turns to the state — and the city’s next mayor — to turn the recommendations into reality. The plan would direct truck traffic bound for the Hunts Point Produce Market off local streets and directly to the wholesale market via a surface-level Sheridan and new Bruckner Expressway ramps at Oak Point Avenue. Most of the recommendations were revealed in May in draft form, but there have been some tweaks in the month since. 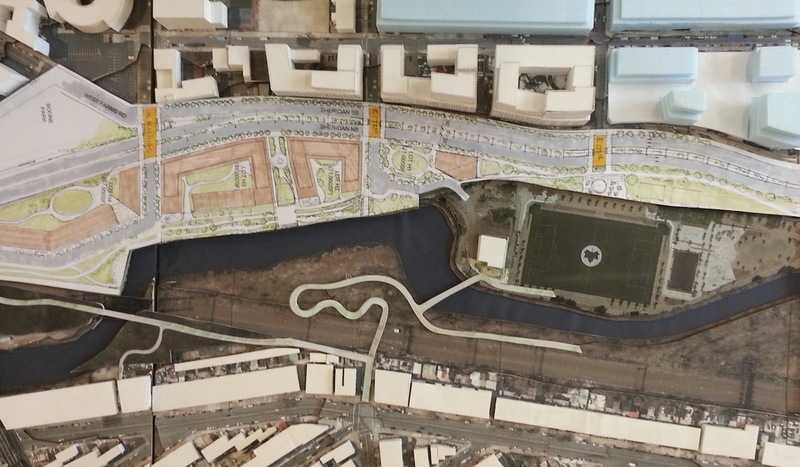 On June 14, every member of the Bronx City Council delegation except James Vacca and Melissa Mark-Viverito signed on to a letter to Deputy Mayor for Economic Development Robert K. Steel, asking the city to add elements identified by the South Bronx River Watershed Alliance, the neighborhood coalition advocating for a teardown. The letter recommends new Oak Point ramps to and from the west, not just the east, which would lead more truckers to take the Bruckner, as well as closing the northbound ramp from the Sheridan Expressway to Westchester Avenue, which would improve neighborhood access to Concrete Plant Park. The city’s final report recommends exploring those ramp changes, but because the study period has concluded, the city will not perform a traffic analysis for those options, instead leaving that to the state. The city also revealed last night that it is recommending hefty sidewalks along the proposed Sheridan surface road, ranging in width from 25 to 30 feet and including planted buffers. DCP staff referred to Queens Plaza and the West Side Highway as examples of streets that have wide, buffered sidewalks. In another boost to pedestrian safety, the city also recommends closing a ramp from Hunts Point Avenue to the northbound Sheridan; this adjustment would shorten a dangerous crossing on Bruckner Boulevard from 65 feet to as little as 45 feet. There are some recommendations that can be implemented by the end of the year, including street safety adjustments and better lighting and wayfinding to improve park access. The city could also advance zoning changes recommended for surrounding neighborhoods, though this and other suggestions will depend on the next mayor. “We are recommending to the next administration that they move forward with our recommendations,” DOT federal programs advisor Linda Bailey said. SBRWA representatives said last night that they would be looking for mayoral candidates to address the Sheridan Expressway plan during the campaign. 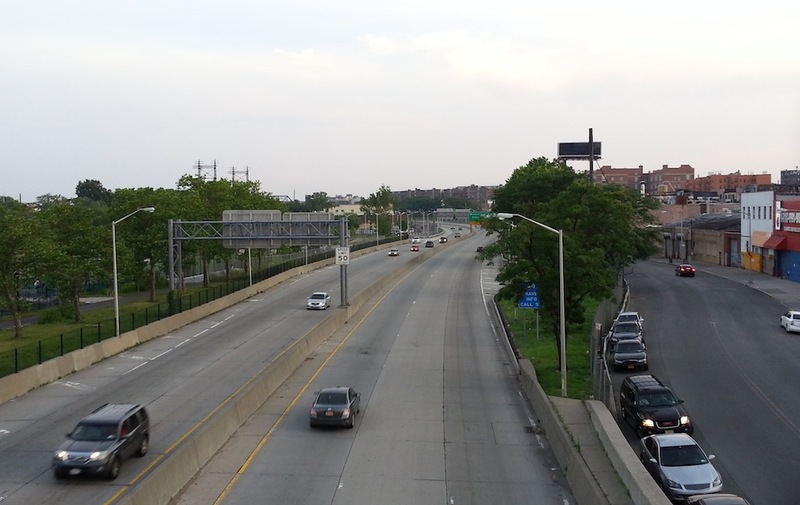 But any changes to the roadway itself — conversion of the Sheridan to a surface road, construction of the Oak Point ramps, or changes to the Bruckner Expressway interchange with the Sheridan — require the state to start an environmental review process. SBRWA is asking the Cuomo administration to allocate a small amount of money to the project, and is seeking support from elected officials to keep the momentum going. The city’s team expressed hope that their work could lead to rapid action at the state level. “We hope that it’s much shorter than past EIS processes for the Bruckner and Sheridan Expressways,” DCP project manager Tawkiyah Jordan said. Mr Cuomo. Tear. Down. This. Wall. Great news for the South Bronx. Combine this with proposed and potential redevelopment of the recently rezoned industrial area adjacent and you have a recipe for a very desirable community. get rid of this highway! The state DOT has proven that if they are pressured heavily enough by local government and local citizens they will *eventually* listen and do the cheaper option. But they will fight you for a very long time trying to do something more expensive and more dangerous. We’ve seen this upstate. NYSDOT is completely in love with road widenings.